Nest Update July 4, 2013 - Happy Birthday, America! I hope all of you Nestizens had a great 4th of July. Here on the nest we were hoping that one or both of our nations newest symbols would make the leap to freedom today but, alas, it was not to be. 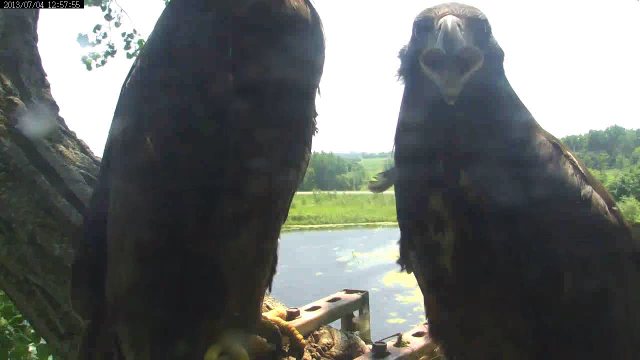 Harmony and Peace didn’t like the flying conditions today and put off fledging for another day. Both Mom and Dad delivered breakfish today albeit at slightly different times. Both brought avians of some type to eat. The kids had fun consuming those and then settled in for a quiet morning of napping, wingersizing and hanging out on the cam mount. The afternoon was a calm and peaceful one too until both parents showed up as Dad delivered a good sized headless fish for dinner. Peace scored the delivery and had it for a good few bites until Harmony decided she had yelled at Mom enough and used her patented steal move on Peace once again. Did I mention that Mom had parked herself on the trunk for this meal? Harmony noshed down a good bit of the fish until she seemed to lose interest. Mom then came down to claim it and actually had it until Peace stole it right out of her beak. Peace then went to the corner of the nest and nibbled the rest of the fish away. Harmony came over for a steal and Mom even tried to get the final piece of tail with a slide down the trunk but Peace triumphed and swallowed her first whole tail of the year (I think it was her first, been so many tails its hard to keep track!). After that meal which consumed (forgive me) about an hour the kids settled in and stood side by side on the nest digesting their 4th of July feast and enjoying the late afternoon sights from the heights. As darkness fell we were treated to some more panning (did I mention we had panning a lot of the day? The cam gnomes did a wonderful job again today and caught most of the action for us. Thanks again BBC for being there for us!) and the kids settled in to await the fireworks later in the evening. A Happy Fourth to Us All! There was a lot of action on the nest today and Mich989Razzle worked diligently to capture it for us. She has been here with us from Day 1 and has made so many wonderful videos for us that Youtube has been warning her she uploads too much. Without her and her skills as a videographer this blog would be pretty dull. All thanks and praise to Razzle for her great work! Well, these two ARE better behaved than Harmon!! You always liked her better!!! Let's see. Maybe a hip check and some high winging would work? Well, the 4th of July was a great day at the MNBound nest! Hope yours was a blast, too! See you on the nest tomorrow! I think we’ll get a fledge!